I’ve had to book a car ferry yesterday in order to take our son back to university at the weekend. While we managed to avoid Wightlink’s dreadful pricing and services, Red Funnel managed to offend us with their punitive and abusive pricing structure. To quote the late Lance Corporal Jones, “Captain Mainwaring, they don’t like it up ’em!” Neither to my wife nor myself. I was coordinating car ferry transport for our son, my wife and a friend. At approximately 1208 yesterday afternoon (24 Sept) I checked sailings and pricing for an outbound sailing on 26 Sept, Friday. The 0835 departure displayed a rate of £23.75 with a Red Funnel promo code of TLM20. After coordinating and getting the responses needed (balancing prices with departure times), I went to book the journey. At approximately 1340 (about 92 minutes later) Red Funnel had increased the outbound fare at 0835 an abusive 40.6% to £33.40 (up from £23.75)! Red Funnel’s argument will be along the lines of ‘managing capacity’ which, of course, is maximising profits. It’s an argument that seems to be accepted by some. However, let’s look at this from other than a corporate post of view: Looking at it from a human being and a voting British citizen, Red Funnel’s (and WightLink’s) action has one simple goal … that of emptying my bank account as much as possible. Our ferries – my mistake, the corporation’s ferries – are, in a very real and practical sense, part of the UK’s national road network and should be operated as such. Part of the road network? Ferries connecting the Island’s roads to the mainland roads should be operated with this sole purpose as a goal. They should not be operated in order for the elite to accumulate or transfer wealth from British working citizens to corporations and the elite who benefit from this exploitative behaviour. I look forward to your solution to this chronic Island problem. 29 Comments on "Letter: Call for MP to do more to tackle ‘exploitative’ ferry fares"
Please don’t delude yourself and think the ferries are running because of Islanders need. You are not the main users and your monies are only the icing on the cake. 80+% of their turnover is from Commercial freight & mainlanders coming over for holidays. Therefore they will not be too interested in your £50 or £60 as they are looking at the much bigger picture! Aren’t those journeys also meeting islander’s needs, because of the dependence on imported food & other goods and the visitor’s spending, and any benefit from commercial export? Isn’t the Cowes Floating Bridge the “Most Expensive Car Ferry” in the world @ £2 for 160 yds? If it isn’t now, it soon will be! I don’t know why Red Funnel don’t do a multilink pass style system like Wightlink do. That gets my car and up to 7 people a return journey at under £50 no matter when it is booked. Admittedly you have to pay for 5 returns up front, but it really saves on the fares, particularly in the summer. I can neither confirm or deny your claim. All I can say, with honesty, is that I’ve never had a problem. I can confirm this, I recently went to book a ticket on line with the motorhome offer only to find there were no spaces available for the whole day. I phoned only to find there were spaces available at a much higher price. Oh, that’s worth knowing. Thanks. I recently wrote to Andrew Turner expressing similar concerns as the author. (although my focus was Wightlink) His response? Join the Better ferry campaign! Although I did sign up – I am completely underwhelmed. Is anybody actually doing anything there, now they have all got their mugs on a video. The Island Ferries and Port Facilities should be nationalised and operated by franchise. Its called market pricing and is driven by supply and demand. No different to plane, train or coach tickets. That’s how business works! I travelled Red Funnel on Sunday and it is far better than Wightlink but there is the rub, its a duopoly and not a monopoly. Don’t vote for parties of ‘either’ colour in future? The UK government have subsidised the Scottish ferries for years ,so why not our ferries? We could build any new ferries on the island. R.E.T Road equivalent tariff if its good for the Scots its good Island. The thing the Scots do which we don’t is make a fuss. If the Isle Wight was in Scotland we would have R.E.T , two MP’s let alone the extra spending on health and education. So if Turner doesn’t deliver on cheaper ferry fares we should bloke the ports, be more Scottish. Really?….have you got a source to validate that statement? That’s if the Floating Bridge was a ferry which its not, I think the clues in the name. Don’t be clever! 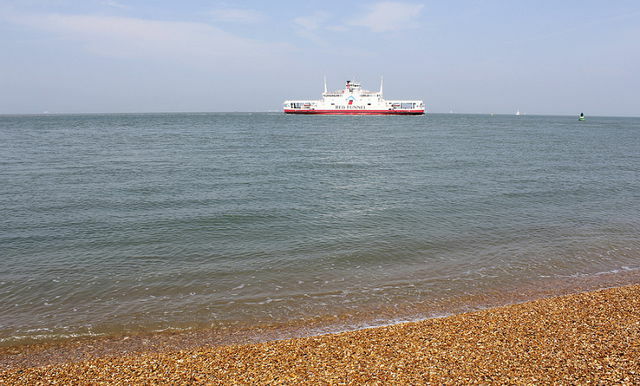 There used to be a ‘chain ferry’ between Gosport and Portsmouth. The clue’s in the name.